Home / Editor's Choice, Entertainment News, Featured Articles, Gossip and Drama, Videos / See your drunken leaders! MIKE SONKO and KALEMBE NDILE party hard and enjoy a bottle of Jack Daniels (VIDEO). See your drunken leaders! MIKE SONKO and KALEMBE NDILE party hard and enjoy a bottle of Jack Daniels (VIDEO). Tuesday, February 12, 2019 - A video of Nairobi Governor Mike Sonko partying hard with political reject Kalembe Ndile and other friends has emerged. 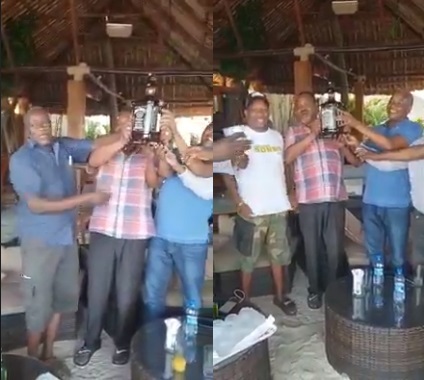 In the video, Kalembe is seen holding a bottle of Jackie Daniels and then invites Sonko and a group of friends to lift the expensive ‘poison’ up before opening it. It is not clear where the party was taking place. Sonko is a well known drunk who keeps alcohol in his office. At his home in Mua Hills, he has a mini-bar stocked with expensive beer.